Nice quality bell boots from the Platinum Pure collection of Eskadron. 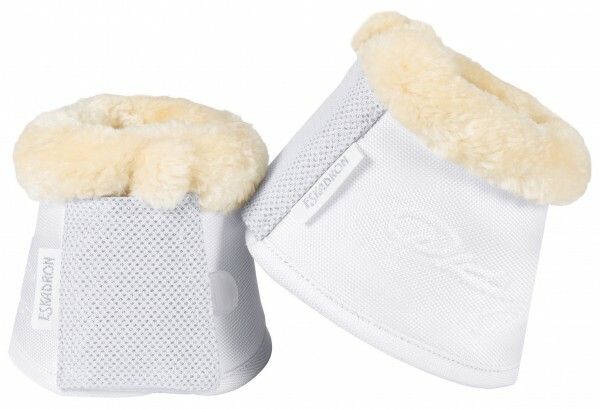 The bell boots are made of strong nylon with an extra soft faux fur trim in the colour natural. Bell boots prevent your horse injuring itself by kicking on the heel or on the back of the balls of the hoof. The bell boots are equipped with a double velcro closure with shimmering Mesh Glitter and Eskadron logo. Lined with soft neoprene with a thickness of 5 mm. Packed per pair. Machine washable. Available in the colour white. Luxury tendon boots with heat-absorbing inside of imitation fur and shimmering outside of Mesh Glitter. Available in the colour white. Luxury headcollar of Eskadron covered with glossy and with a matching rope. Available in the colour white. Luxury saddle pad with glossy outer fabric, lane of Mesh Glitter and moisture wicking lining. Available in the colour white.